Venezuela is an international education market that has shown significant growth in recent years, but economic troubles and political tensions have spilled into all sectors of society. These same factors have played a part in shaping the country’s current context with respect to exports, international relations, and the mobility of both students and capital, and can be expected to continue to do so in the years ahead. Education in Venezuela is administered and regulated by the Ministry of Education. Schooling is compulsory for the first nine years, after which students are streamed into humanities and sciences for two years before earning a bachiller, or directed into two-to-three-year specialised schooling leading to a technical degree. A growing industrial sector has spurred increasing numbers of young people to attend technical schools. At these schools they can choose from a range of short self-improvement courses to more in-depth courses that end with full trade qualifications at the end of three years. According to the World Bank’s most recent survey, which was conducted in 2012, there were 126,014 technical students in Venezuela at that time. Public education is free and open to all Venezuelans all the way through the tertiary level, but private schooling is an option chosen by many families, particularly at the secondary level. However, the private sector’s share of tertiary students is less than 20%, down from a high of around 40% during the late 1990s. Private schools, like public schools, are supervised by the Ministry of Education, and are required to meet the same curricular standards. Overall access to education has improved greatly in the last decade. The anti-poverty organisation Bolivarian Missions, launched in 2003 with a focus on literacy and university preparation, expanded educational opportunities to previously excluded impoverished segments of the population. Open university admissions, the creation of new public universities, and university outreach programmes have boosted post-secondary enrolment from 670,000 in 1998 to almost 2.5 million in 2013. One institution established in 2003 – the Bolivarian University of Venezuela – has reached a present-day enrolment of more than 180,000 students, and aims to eventually accept one million at campuses spread across the country. The courses offered are those considered by the government to be national priorities, such as engineering, law, and health care, and graduates are expected to staff free public health clinics, literacy centres, and government media outlets. The overall tertiary enrolment ratio passed 78% in 2009, the last year for which such data is available. The graph below, from Quandl, shows the general upswing beginning in 1975. The steepest gains occurred on the watch of former President Hugo Chávez, who died in 2013. In the last few years of his rule, political challenges had begun to mount, and it is his successor Nicolás Maduro who has seen many of those same issues erode his approval rating to barely more than 20%. The upcoming parliamentary election in December could see President Maduro’s support in the National Assembly crippled by a 29-party super coalition that has gained strength from citizen dissatisfaction with high inflation, high crime, and recurring consumer goods shortages. In the education sector, hundreds of professors have resigned in recent years to take jobs in other fields or countries. The key issue for faculty is low pay, and the main effect has been a general lowering of teaching and research quality in the country’s universities. In the past, many Venezuelans who studied abroad later returned home to teach. Today, those who earn advanced degrees overseas rarely return. Already an estimated 9,000 Venezuelan scientists are living in the United States, compared with 6,000 employed in Venezuela. Critics of the original Chávez education expansion say that free access to new universities encouraged tens of thousands of students to attend classes who might otherwise have pursued other study or work options, while autonomous institutions received less attention and saw their budgets decline. Those autonomous schools were cost-free like the new universities, but they were also more academically rigorous and were inaccessible to all but the best students. Many still worry that students with top grades will not receive spots at their chosen universities, but the government claims exceptional students can be identified and given special consideration. With tertiary education plagued by quality issues, young Venezuelans are increasingly looking overseas. UNESCO puts the number of Venezuelan students abroad at nearly 12,000 in 2012, and the top ten destinations are summarised below. 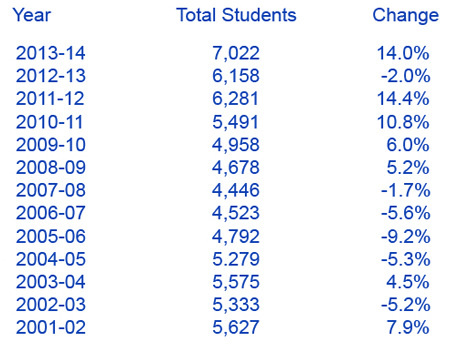 IIE’s Open Doors report, which has slightly more detailed data, puts the number of Venezuelan students in the US at 7,022 for 2013/14, and 6,158 for 2012/13. That represents an increase of 14% in one year, and that followed a previous 14% jump from 2010/11 to 2011/12. With the exception of a small drop from 2011/12 to 2012/13, the trend in mobility to the US has been trending steeply upward since 2008. But perhaps the most up-to-date government figures come from Venezuela’s public ombudsman Tarek William Saab, who in April 2015 put the number of Venezuelan students abroad at approximately 18,000. If accurate, this would represent the sharpest rise of leavers to date – about 50% more than UNESCO’s 2012 figures, and an important indication of the strong demand for study abroad among Venezuelan students and families. As of 2013, more than 60% of Venezuelan students in the US on study visas were undergraduates, with business and engineering the two most popular fields, accounting for 25.6% and 15.5% of the total respectively. About 10% of students were enrolled in intensive English-language programmes. Also as of 2013, Venezuela ranked fourth in Latin America for sending to the US – behind Mexico, Brazil, and Colombia. However, this ranking may well have changed in the last two years due to the introduction of strict controls on currency exchange, among other factors. Though outbound mobility is up sharply, Venezuelan students abroad have been hampered for almost a year by tighter currency exchange rules that restrict the flow of funds outside the country. Transferring money from Venezuela happens through the Centro Nacional de Comercio Exterior (CENCOEX, formerly the Commission for the Administration of Currency Exchange [Comisión de Administración de Divisas], or CADIVI) and is difficult and expensive due to such capital flight controls. In short, students or families who wish to exchange Venezuelan Bolivars for foreign currency at any sort of reasonable exchange rate must apply to CENCOEX to access its reserves of foreign funds. The agency therefore plays a critical role in enabling (or not) the study abroad plans of Venezuelan students. According to agents in the market, those with access to funds held outside of the country are less affected and able to carry through with their programmes abroad. “CENCOEX was created to ‘come clean’ from the allegedly corrupted CADIVI regarding imports and exports as well as exchange students, when in fact it is currently the exact same organism functioning at a more severe scarcity level,” adds Luis Arria of the Venezuelan education agency Evospash. CENCOEX policies for students abroad offer favourable exchange rates for the currencies of the students’ host countries as long as students are studying one of 178 subjects prioritised by the government. According to government officials, the new restrictions on exchanges came about in response to student abuse of the system. Public ombudsman Saab told University World News that up to 60% of students who previously received the government exchange rate were not studying required subjects, and also noted that many of the group had no intention of returning to Venezuela. The resulting clampdown affected thousands of overseas students, and largely accounted for the 2% dip in 2012/13 enrolments seen in the Open Doors data above. Working with CENCOEX can be a daunting task. Delays are common and rules change often. International educators partnered with Venezuelan students would do well to familiarise themselves with the organisation’s procedures, but, on a bright note, practical advice about how to successfully engage with CENCOEX is available online. For the moment, the tighter controls this year have eroded the ability of some students and families to finance studies abroad. Local education agents report there is still strong demand in Venezuela for longer-term programmes, including those at the post-graduate level. Students bound for such programmes reportedly have better luck in accessing foreign currency via CENCOEX, whereas shorter-term language studies have been more sharply affected by the currency controls with the vast majority of aspiring language students currently denied access to exchange funds by CENCOEX. For another insider perspective on the complex Venezuelan market, readers can turn to Jose Ramon Camejo Silva of Education Around the World. ICEF Monitor interviewed Mr Silva in 2012, and he offered valuable advice for foreign partners planning to work with Venezuelan students. Though Venezuela is among the top ten countries globally in terms of spending on education as a percentage of GDP, falling oil prices, capital flight outside the country, and bond market chaos have drained the country of needed revenue. Some economists have predicted a debt default. Meanwhile, an interventionist US foreign policy has millions of dollars going to Venezuelan opposition groups each year – as such, it both reflects and aggravates the currently strained relations between the two countries. Unemployment, crime, and shortages of basic materials have taken a toll on the President’s popularity, but opposition politicians have low ratings as well due to their perceived connections to puntofijismo – the multi-decade period of iron rule by the wealthy that was broken by the political ascension of Hugo Chávez. If President Maduro’s opposition win, they will be able to force a recall election, which could mean change to Venezuela’s education sector as soon as 2016. If they lose, the next presidential contest is in 2019. This entry was posted in Agents, Higher Education, K-12, Regions, South & Central America, Venezuela and tagged universities with international students, polytechnic, undergraduate admissions, undergraduate student recruitment, student mobility.